A few of the Synthasystem modules feature panel-mounted trimpots. On the VCO, I'll be installing these trimpots for the 1V/Oct adjustment trimmer. The Ring Modulator and the Tuner/Monitor also have these: presumably they're all settings that may need to be readjusted more often than your typical trimpot. The PCB sets come with these neat little trimmer chicklet PCBs. The actual trimmers go inside these panel-mount housings from Bournes. 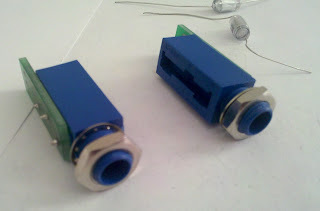 They look like blue 1/4" jacks, with a trimmer screw in the middle (tough to get a pic, sorry). I just popped the trimmers (Bournes 3600 series) into the housing (Bournes H-83P), and then solder it onto the chicklet. Anyhow, for wiring there's 3 through-hole pads at the back of the PCB to attach wires. These should make the wiring a lot simpler!